BAD!SLAM!NO!BISCUIT! RETURNS TO STOMP THROUGH THE CITY OF YOUR HEART WITH LASERS FOR EYES AND A SUPER FREEZE TAIL SWISH! Because it is March and we battle You Are Here! We want your words on stage for two minutes with no props no music and your original material, TO BE JUDGED FOR PRIZES, FIRST PRIZES. A WHOLE LOT OF FIRST PRIZES! We want you in the audience to judge, TO JUDGE TO GIVE AWAY FIRST PRIZES. We want you in the audience to audience, TO AUDIENCE YOUR HEARTS OUT ALL OVER THE FLOOR. Finnigan and Brother is the duo of siblings Chris and David Finnigan. 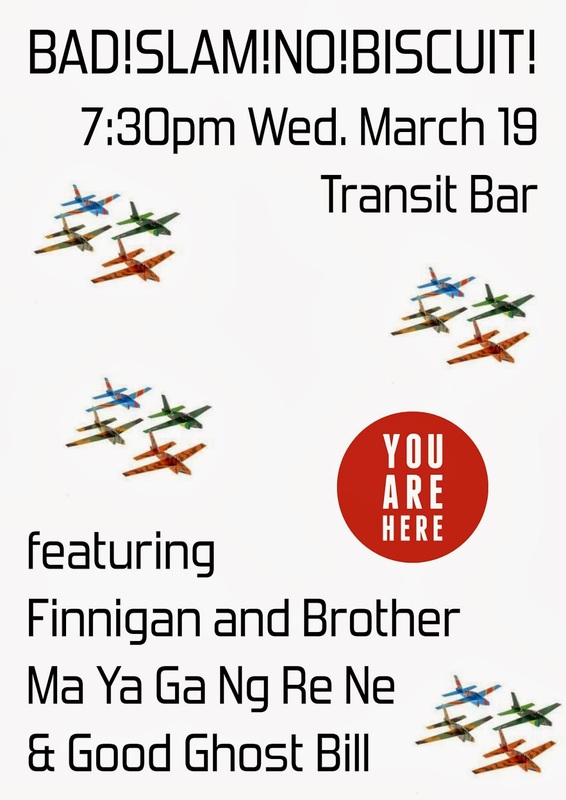 Formed in Canberra, Australia, Finnigan and Brother have performed their ragged blend of music and spoken word for crowds around Australia and Colombia. Chris creates eerie and blissful songs and soundscapes using a guitar, loop station and FX pedal, over which David performs scattered story-poems sampling popstar interviews, overheard conversations, science texts, FM/AM radio and ancient historians. Ma Ya Ga Ng Re Ne (aka Thomas A. Day) is a multi-disciplinary artist, who is currently exploring experiential installations, which seek to synthesise elements of digital and analogue collage, manipulated visuals, sound, and live performance. He has featured as a spoken word, performance and installation artist at Australian festivals, arts spaces and events including the Queensland Poetry, Woodford Folk, Tasmanian Poetry, Brisbane Emerging Arts, Brisbane Fringe and Brisbane Festivals. Good Ghost Bill (aka Bill Moran) was a proud member of the 2011-2013 Austin Poetry Slam national teams, as well as the 2012 & 2013 Austin Poetry Slam Champion and 2013 Southern Fried Haiku Champion. He has co-directed the Texas Grand Slam two years running, featured at venues and taught workshops across the US, conducted long-term poetry programs at a local juvenile justice center, as well as released three books and a CD. He is currently the president of Mic Check, a non-profit poetry and spoken word organization based in Brazos County, Texas. And because Hadley is dead (MAY HE REST IN PEACE) we fill The Hadley Memorial Slots with Ellie Malbon. So join BAD!SLAM!NO!BISCUIT!, 7:30pm Wednesday 19 February, Transit Bar. Remember, no props, no music, and your original words, for prizes!